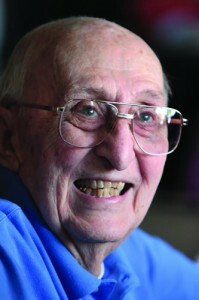 Ray Werner is important in so many aspects of his life, both at CC and in other pursuits. 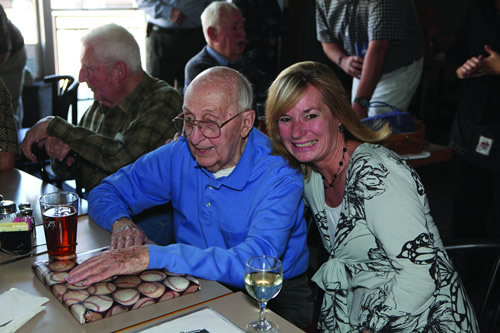 Isn’t it fitting that Ray had more than 200 friends, colleagues, family members, and well-wishers to his surprise 90th birthday party in April at one of his favorite places to eat — Panino’s? We are grateful to have Ray as a professor emeritus at Colorado College, active in so many ways at CC still, emailing more than 75 fans daily with sports, economics, and scholarly articles. On the occasion of his 90th birthday, we can illustrate his many varied awards and accomplishments. Ray was an economics professor at CC from 1948 to 1987. He has lived his conviction that teaching in the liberal arts should focus on the whole person, and that a liberal arts education should yield a refined, broadly educated human being. Ray expected and demanded much from his students and they remember him with great fondness for his keen interest in their personal growth and understanding of economic theory and practice. As his passion about economics is well known, so is his passion about collegiate hockey. Not only did he help found the WCHA, his help with the conference and the entire NCAA hockey through the years has made it what it is today. Ray recently received the Joni Brandner Award at the Colorado College annual Hockey Banquet because of his undying and unselfish support of Colorado College Hockey. Ray being congratulated by Lora Louise Broady ’83, who drove down from Denver for the party on April 21, 2012. At CC since 1948, he is widely known for his writings on legal aspects of marketing, having served as the editor of legal developments in marketing for the Journal of Marketing for more than 20 years. Along with Professors Doug Mertz and Fred Sondermann, Werner started the interdisciplinary major in political economy. Werner was the recipient of the Sidney G. Winter Award as outstanding teacher of economics and business administration at the college in 1967, and held the Louis T. Benezet Faculty Rotating Fellowship at the college (1965–66). Werner served as debate coach, was co-founder with Juan Reid and Lew Worner of Blue Key, and served on the faculty athletics board for several years before becoming its chair for an additional 25 years. He headed the faculty-student committee charged with planning El Pomar Sports Center. During that same 25-year span, he also represented the faculty on the Western Collegiate Athletic Association. A founder of the WCHA, Ray was honored by his selection as a charter member of that group’s Hall of Fame and received its Distinguished Service Award in 1986. Ray could also be seen behind the timer’s table at all CC basketball and football games. Here’s to you, Ray, on #90 with so many more to go! See another story about Ray. I still remember Prof Werner’s Econ classes! He was one of my favorites!